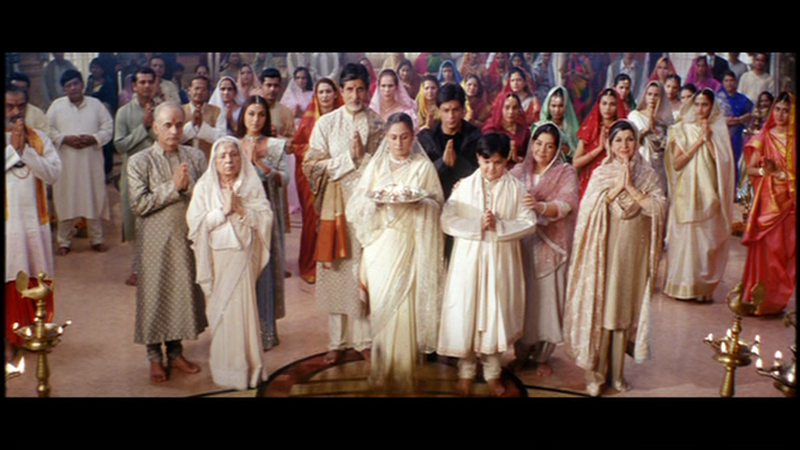 K3G is an indulgence that I only allow myself to luxuriate in occasionally. While I love the first half of this film, despite all its flaws and typical Karan Johar extravagances, I just wish that the second half came anywhere close to the emotional appeal of the opening melodrama. Considering the stellar cast it’s particularly disappointing that the whole doesn’t live up to the promise of its parts, but at 3 ½ hours maybe only watching the first half isn’t such an issue. 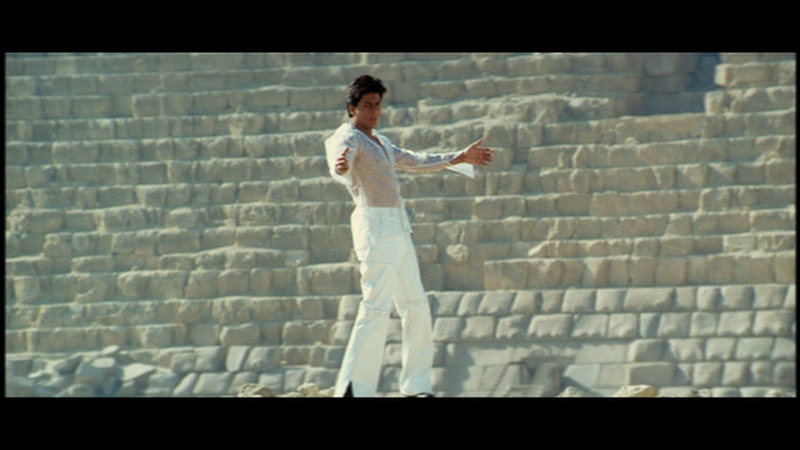 It also contains my all-time favourite Shah Rukh song with plenty of shots featuring SRK in those lacy see-through shirts, which is probably enough of an explanation for my love of this film, but K3G also brings back memories of learning Hindi and actually starting to understand dialogue without subtitles. Special for a few reasons then, but this song is still the best part of the film. 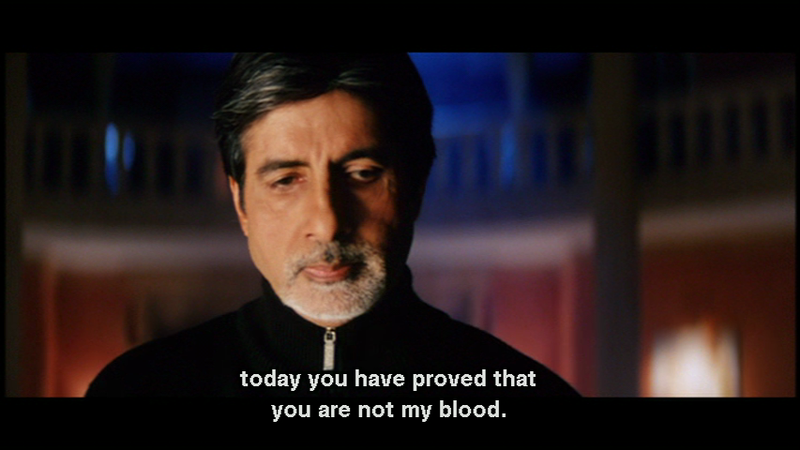 For those who haven’t seen K3G, it’s a fairly routine story of your basic multimillionaire family and the ups and downs of their domestic relationships. The Raichand’s live in a large ostentatious stately home which seems as far removed from India as it is possible to get despite the fact that it’s supposed to be relatively close to a lively market in Chandni Chowk. 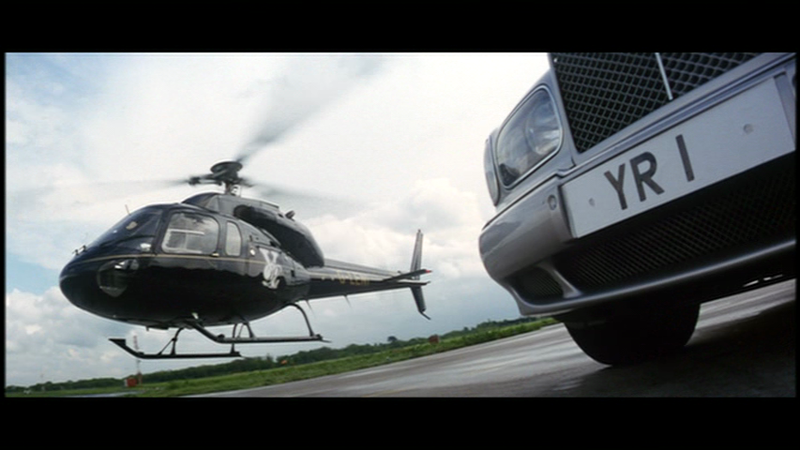 It’s the kind of family where running late means having to hop on the helicopter to get home in time for Diwali celebrations, but despite all the lavishness of their lifestyle, it’s a family where there is a lot of love. 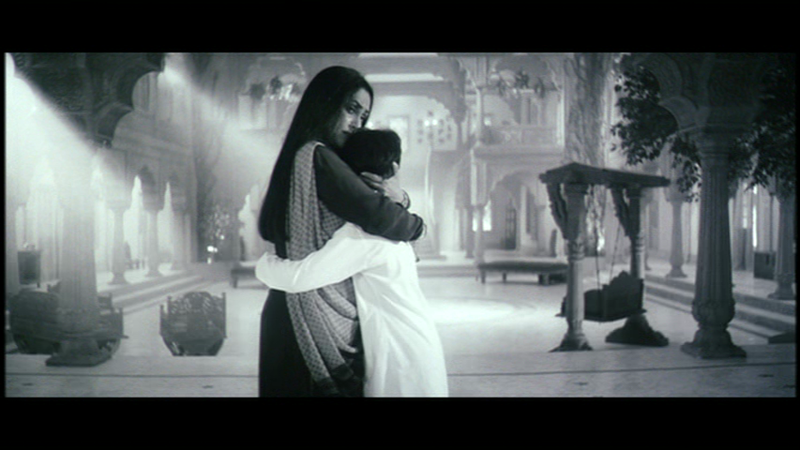 This is emphasised in the opening credits as Nandini Raichand (Jaya Bachchan) plays with her young adopted son, but it’s also obvious in the interactions between Rahul (naturally this can only be Shah Rukh Khan) and his father Yashvardhan Raichand (Amitabh Bachchan) as well as in the later scenes with his mother and younger brother Rohan (Kavish Majmudar). 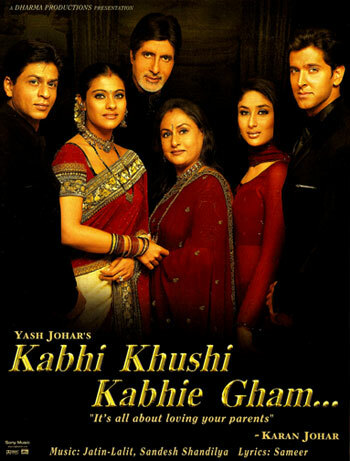 Problems arise when Yash decides that Rahul will marry Naina (Rani Mukerjee) who seems ideal for the position of rich man’s wife entrusted with carrying on the family traditions. However Rahul has other ideas as he has fallen in love with Anjali Sharma (Kajol), the daughter of a local shopkeeper in Chandni Chowk. Just to keep things in the family, Anjali is the niece of Rohan’s nurse Daijan (Farida Jalal) and has a younger sister Pooja who is roughly the same age as Rohan. This helps later on in the story, although initially it just seems another way of emphasising the gap between the two families. 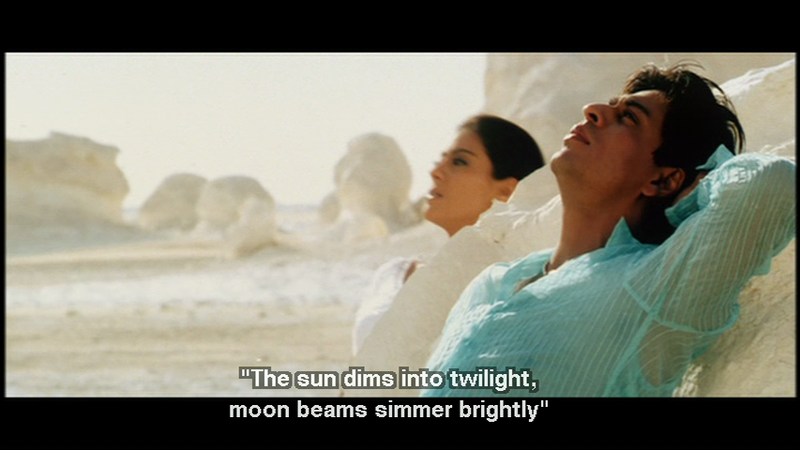 The first half of the film sparkles with the romance between SRK and Kajol while the various family relationships add depth and interest to the story. The two grandmothers, Achala Sachdev and Sushma Seth, ensure a typical Indian family feel despite the Anglicised mansion, while the glaring discrepancies between the Raichand’s home and the (somewhat sanitised) streets of Chandni Chowk are used to good effect. Kajol is lively and boisterous as Anjali, while SRK is more retrained and less dramatically emotional which helps keep things under control. There is a smattering of comedy in the romance too, which both SRK and Kajol handle effortlessly, and the appearance of Johnny Lever in comedy uncle mode is thankfully kept to a minimum and doesn’t disrupt the story. The other characters all fit in too – the young Rohan is petulant and spoilt, just as a rich kid should be, while Anjali’s younger sister Pooja (Malvika Raaj) is bratty and approaching obnoxious at times, which does actually tie in reasonably well with her later persona. Naturally Rahul chooses love over duty and ends up cast out of the bosom of his family, although he does have Anjali and her sister Pooja as compensation. 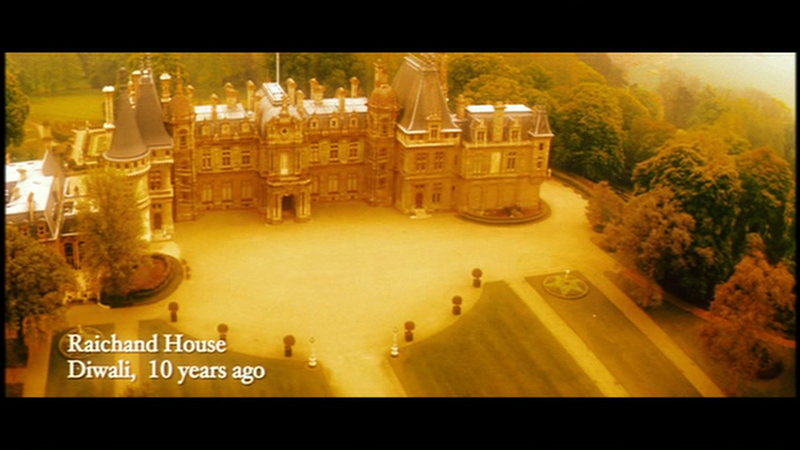 Of course, this is a Karan Johar film, so it’s no surprise when we reconnect with Anjali and Rahul ten years later to find that they are living in a large and opulent home somewhere in London, despite the fact that Rahul left with nothing – pretty impressive work! 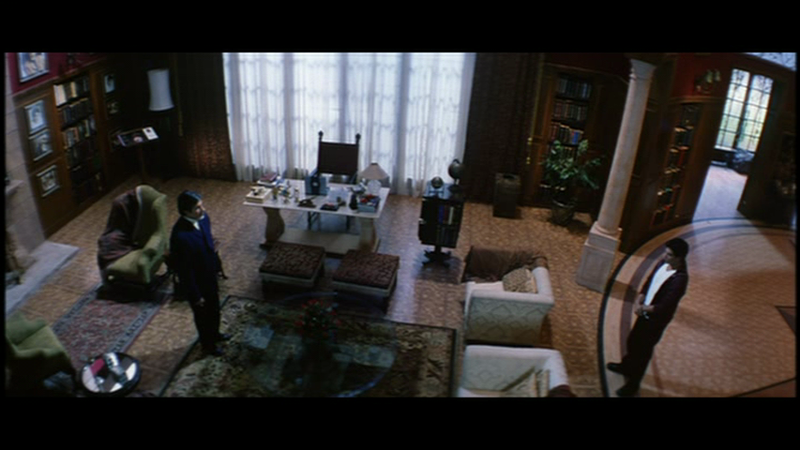 But things start to fall to pieces once Kareena Kapoor enters the picture. This was the first time I’d seen her in a film and it was also the last for a very long time – based solely on this dreadful performance. Hrithik Roshan as the grown up Rohan is also sufficiently unimpressive, seemingly unable to decide between the role of hot and macho student running amok in ridiculously expensive cars, or emotional wreck searching for his brother. The two completely derail the romance and it’s hard to come up with any reason why Pooja has to dress like a call girl and act like a complete airhead. 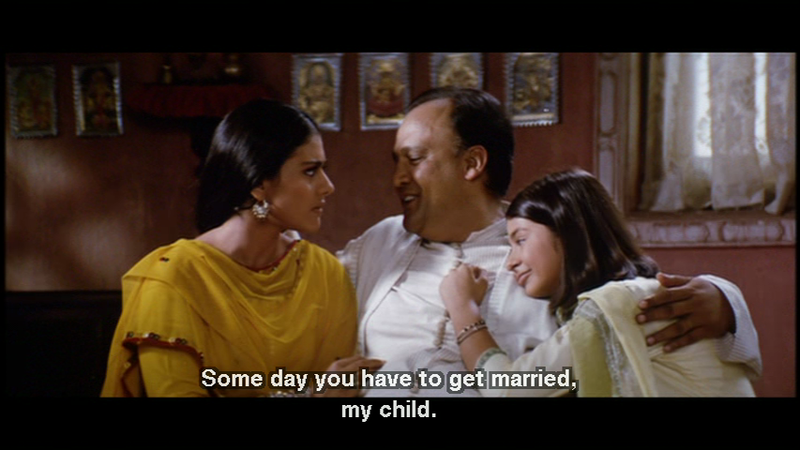 The film also dives deep into overindulgent farce as Anjali complains about her son becoming too English (hmm, could this be because they’re living in England and he’s attending an English school?) while Rohan decides that staying with his brother while pretending to be someone else would be a good way to reconcile his father and brother. Because that would definitely work. If you can ignore all the self-indulgent weeping from Rohan and the insufferable unpleasantness of Pooja, the rest of the film is endurable, although unbelievably long and drawn out with a ridiculously contrived ending. Karan Johar goes overboard trying to tug on his target NRI audience’s heartstrings with a rendition of the Indian National Anthem which seems totally out of place, and there are far too many references to ‘loving your parents’. Even apparently when they don’t love you and repeatedly tell you so. There are a few moments where the easy flow of the first half is almost recovered, but overall the second half is disappointing at best, particularly after such a good beginning. Thankfully though there is still SRK, who is as charismatic as always, and the Shah Rukh and Kajol jodi works even while the story around them falls to pieces. If only the whole Kareena Kapoor and Hrithik Roshan storyline had been cut, this would have been a much more enjoyable film, although still not perfect. Still, I do recommend watching right up until the interval – after that it’s at your own risk! 4 stars for the first half, but only 1 for the second. Apologies – this post is brimful of spoilers. Mind you, no one who edited the trailer or the geeks writing for Wiki or reviewers for some major papers seems to give a toss about giving away details. 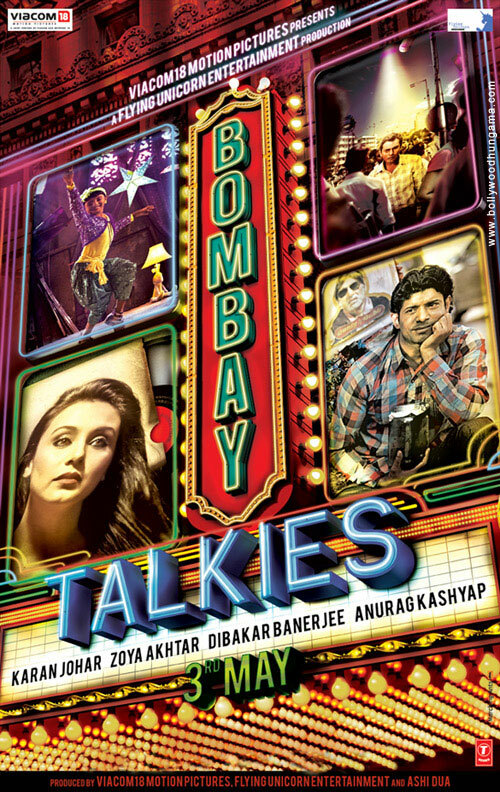 Bombay Talkies sounded like an odd but potentially brilliant project. Four directors, four stories with the only connection being an homage to the Indian film industry. And I liked it a lot. Not all the stories are equally strong but they each have something that has stuck with me since seeing the film last week.